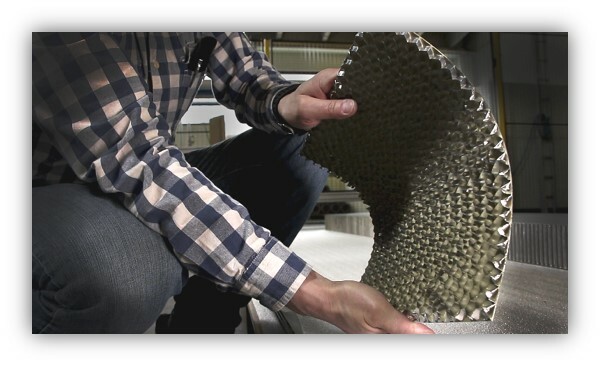 Potmacore is an aluminium eco-friendly and 100% recyclable layer board with a honeycomb core. 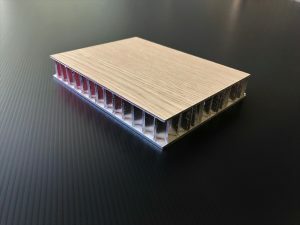 This lightweight, self-supporting and moisture-proof honeycomb panel is ideal for the supporting structures of weight-restricted applications and for module structures. We constantly develop our products in conjunction with our customers. 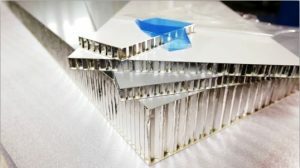 The structural thicknesses can be adapted to fit the systems of our customers; between 6 to 100mm with a spacing of 0.1mm. Delivery from one board up to a delivery gross of thousands of boards; no minimum amount. 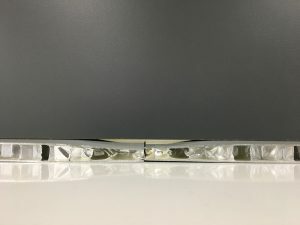 All panel alternatives are available also semi-finished, when one surface board is attached to the honeycomb core and the other is delivered along but loose. This enables the making of curved surfaces. 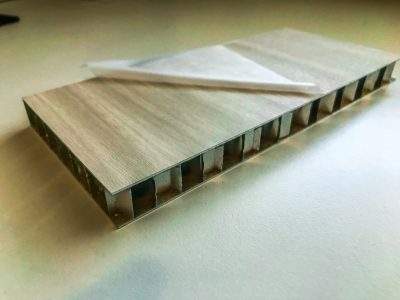 The semi-finished board gets bent to the right curve, thereafter the other surface board will be glued on its position, and a rigid, lightweight and curved structure is formed. Both surfaces coated with epoxy primer which creates an excellent grip for laminating, painting etc. 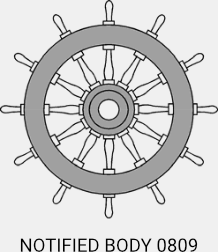 Can also be delivered with thinned edges; the long sides are pressed thinner (cf. a plasterboard, gyproc), when more space is needed for putty or a lipping at the junction of boards. A honeycomb panel with pre-painted surfaces with a temporary protection films. C means that both surface boards are painted, C/1 means that the front surface is painted and the backside is primered. As a stock colour we have RAL9010 (gloss level 30-35), other colours upon request. Can also be delivered with thinned edges. 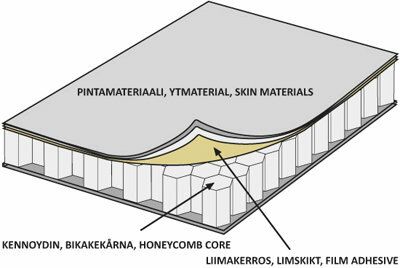 A honeycomb panel with pre-laminated surfaces. 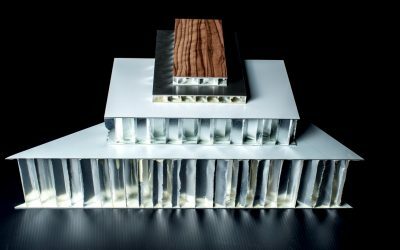 Lhl means that both surface boards are laminated, and Lhl/1 means that the front surface is laminated and the backside is primered. A honeycomb panel with pvc vinyl on surfaces. V means that both surfaces have vinyl on, and V/1 means that the front surface has pvc vinyl and the backside is primered. You find the certificates to our different product alternatives by clicking the above link. 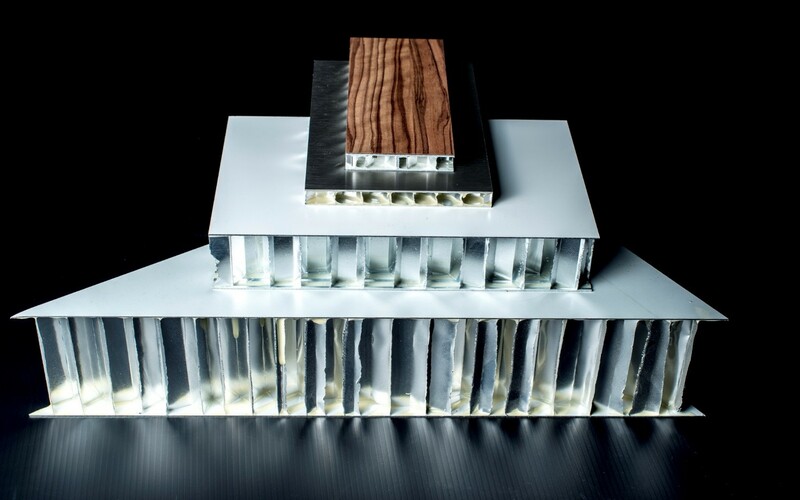 Potmacore panels are certificated for maritime, building and rail fleet industries. All board types can be delivered ready-cut according to the customer’s measures and sequenced on pallets. Billing sizes according to the list below.